I just watched the original Office, in part because I wanted to watch this movie and in part because I never had before, despite being a huge fan of the American edition. It’s one of those shows you either love or hate, get or miss, watch every episode of religiously or completely scoff at. If you’re reading this review, you probably have some feeling toward either show, and just to let you know where I’m coming from, I absolutely adore the Scranton, PA version, I think it’s the best and perhaps only great TV comedy since Friends. 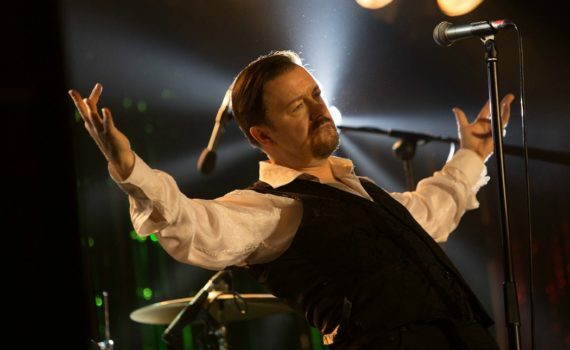 So the British version had a lot to live up to in my case, and it holds its own, but I don’t think I can say the same about David Brent, a film that didn’t really need to be made. Years after the documentary The Office aired on BBC2, David has moved on with his life and his semi-celebrity existence. Well, actually, he’s not really a celebrity at all and he hasn’t really moved on past anything; he’s still a salesman and still holds onto the dream of becoming a musician. The dream is so important to him that another docu-crew with follow him around as he heads out on tour. Not that his music is in demand; he had to mortgage his future in order to get enough money together to fund a two-week “tour” that exactly no one wants but him. But, hey, you shoot for your dreams, and David’s is to write/perform music on stage. Unfortunately, his terrible personality continues to get in his way and his lack of artistic ability will stop him from earning even one fan. The American Office is wonderful, the British original series is great and much too short, but this movie version just doesn’t carry over the same magic. Gervais’ Brent character is hilarious, it’s nice to see him again, but that’s all there is, there’s nothing else, he failed to write in comedy other than David being annoying David for 90 minutes. He overuses his patented laugh, which only popped up every once in a while on the show but which is on repeat in this movie. He didn’t add in any other funny characters, going it completely alone, which is the exact opposite of what made the show work. And the music is too heavily relied upon for the humor; the songs are silly but not that memorable. I laughed a bit watching this film, but mostly at David’s awkward moments, which are incredible, but I needed more to enjoy the whole project, to make it anything more than a cheap cash in of something I had already bought.